Energy efficient windows are more important than ever. Not only to help save your pocket book from rising energy costs, but using less energy is just great for the planet in general. As climate scientists predict hotter summers and cooler winters over the coming decades, energy saving windows can make a big difference and help keep you comfortable all year round. You know that your windows should be energy efficient, but how do they work? And more importantly, what should you be looking for in a window to ensure it will help save you energy? 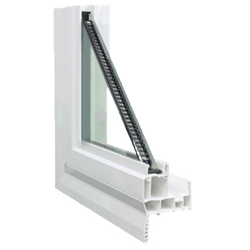 This simple guide to energy efficient windows will arm you with all the knowledge you need to ensure you’re getting the windows you’re looking for. What Makes a Window “Energy Efficient”? Unlike appliances or vehicles, windows don’t require any electricity or gas, so they don’t really consume energy the traditional way. When you’re talking about an energy efficient car or microwave, you’re talking about the power they consume. The more energy efficient they are, the less power they require. Windows don’t directly use energy, but they impact appliances that do – specifically your heating and cooling system. An inefficient window will allow more heat or cold into your home, forcing your HVAC system to work harder, and consumer more energy. An energy efficient window will reduce the amount of temperature transfer between indoors and outdoors to allow your HVAC system to work less and thus save energy. Glass is a really poor insulator, which is why a single pane of glass tends to be the least energy efficient type of window, and is rarely used these days. In energy efficiency, there are two major designs that make windows energy efficient: gas between panes of glass, and special coatings to reflect heat. You’ll hear the term double glazing or triple glazing a lot when it comes to energy efficiency. Glazing is simply another name for window glass, so when you hear the term “double glazing”, you can safely assume it’s two panes of glass with a special gas between panes. This is similar with “triple glazing”, with one catch we’ll discuss below. It’s important to keep in mind that in colder climates it’s sometimes preferable to create a “greenhouse effect” when the sun shines on a window to reduce heating costs on cold days. What is considered an energy efficient window in one city, may not be true in another. Always consult a professional to ensure you’re buying the right windows. Windows with two panes of glass are the most common windows on the market. The two panes of glass are completely sealed with a layer of gas between the two panes. There are several types of gas used in this application, like argon or krypton, that are extremely poor at transferring hot and cold temperatures, which makes them perfect for separating the varying temperatures between indoors and outdoors. Triple glazed windows are similar to double glazed, just with an extra slice of glass in the middle, which creates two chambers of gas. The triple glazed window is generally more energy efficient, but also heavier and more expensive. Another method of reducing heat transfer is to use a special coating that helps to reflect the heat. These Low-E coatings are typically a really thin metallic coating that’s nearly invisible to the eye. The coating is generally applied on the inside of a double glazed window, or sometimes suspended in a thin sheet between the panes. Mirror glass is a little more obvious, as the thicker the application, the more it works like a one-way mirror to reflect the sun, while allowing you to see outside. These windows tend to be a little darker and not let in as much light. If you have any questions about energy efficient windows, or what type you’ll need for your home, contact our experts or drop by our showroom for a quick demo!